That's not so hard is it? Did you know that 371 million people have diabetes and half of them don't even know it yet? It's a very serious thing but it certainly doesn't mean you can't eat well, and I'm going to prove it to you today! 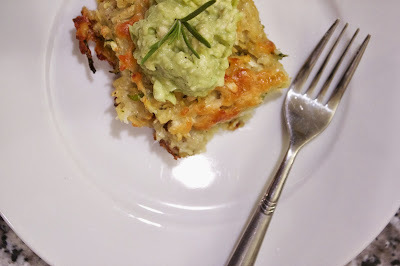 I've got a fantastic recipe here and then our whole team has even more delicious recipes for you to try. 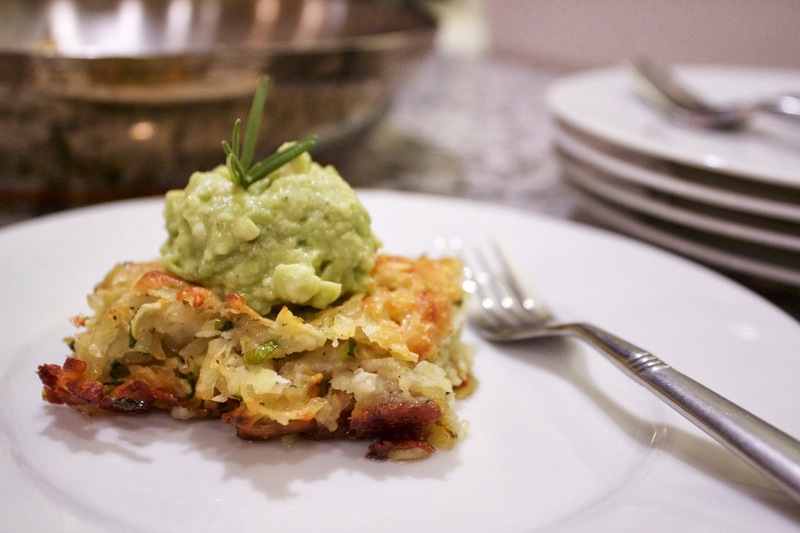 I went with an adaptation on this potato and zucchini pancake recipe. The original recipe had russet potatoes and regular bread crumbs. I subbed those out for sweet potatoes and some whole wheat bread crumbs. 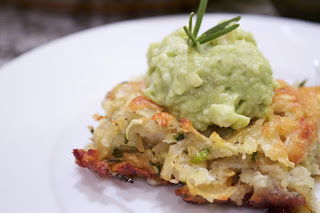 I kept the parmesan cheese in since it was a smaller amount and then instead of putting mascarpone spooned on the top, I made a chunky mash of avocados and scooped that on instead. 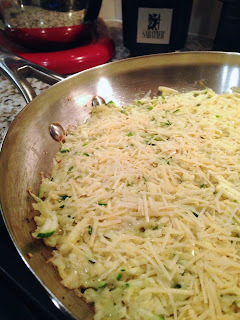 I used the Microplane adjustable slicer on the smallest setting the julienne the zucchini. I liked the small strips it made instead of shredding them and the hand slicer was a nice smaller alternative to my traditional slicer that takes up half the counter top. Once you mix all the ingredients together, you spread it across the hot skillet, creating one large pancake. I loved the Nouvelle Copper Stainless steel skillet and 12 inches was the perfect size. After cooking the bottom to a crisp brown you can put the entire skillet directly in the oven to get the top nice and crispy. If you're not diabetic or just need to splurge, sprinkle the top with even more parmesan to create a beautiful cheesy crust as it bakes. 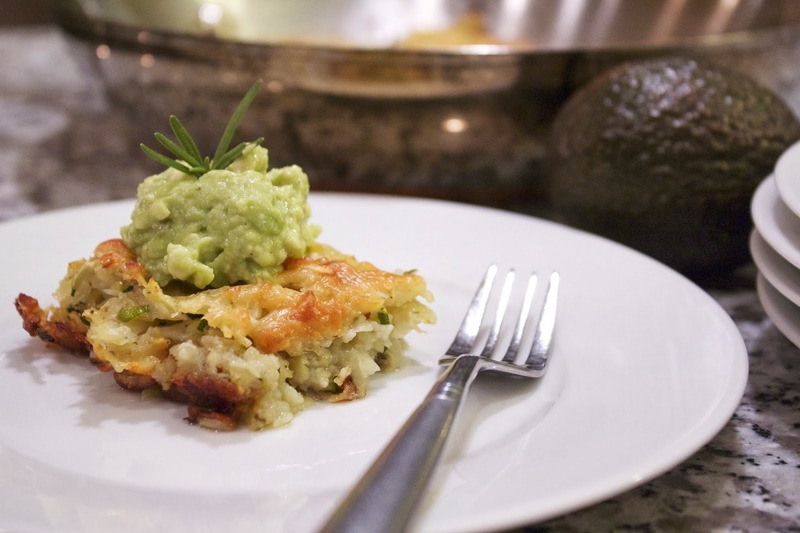 It comes out perfectly crispy and with a dollop of fresh avocado on the top it can make an entire meal or cut it into smaller squares to serve as an appetizer. Ready to enjoy some of the other recipes and enter to win? I'll be giving away the Microplane Adjustable Slicer with Julienne Blade plus the Anolon Nouvelle Copper Stainless Steel 12 inch skillet! Enter at the bottom of the post! Place an oven rack in the center of the oven. Preheat the oven to 450 degrees F.
Lay the potatoes and zucchini on 2 kitchen towels. Bring the corners of the towels together and squeeze out the moisture from the vegetables. Place the vegetables in a large bowl. 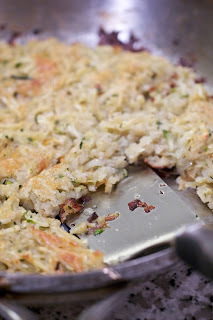 Add the garlic, chopped rosemary, 1/4 cup Parmesan cheese, bread crumbs, egg whites, salt, and pepper. Mix well until all ingredients are combined. 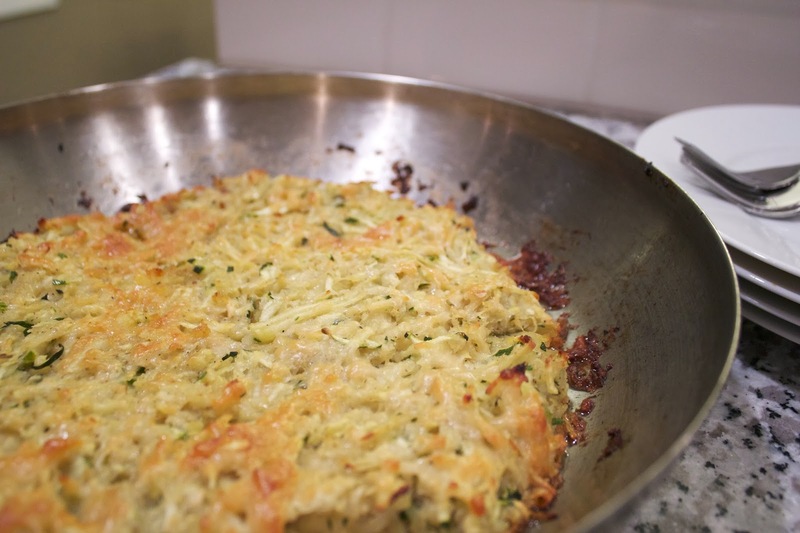 In a 12-inch nonstick skillet, heat the olive oil over medium heat. Add the vegetable mixture to the pan. Using a spatula, press the mixture evenly into the pan. 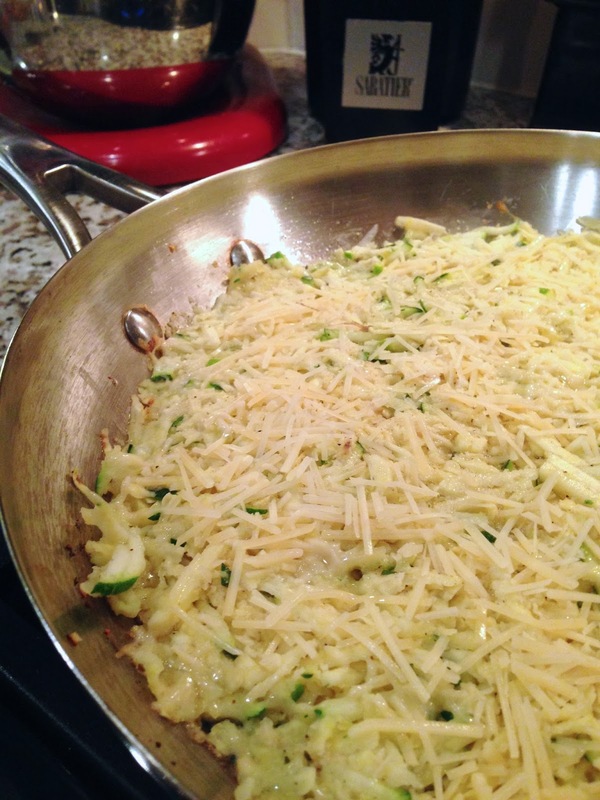 Drizzle the top with olive oil and sprinkle with the remaining 1 tablespoon Parmesan cheese. Cook for 8 minutes or until the edges of the mixture begin to brown. Place the skillet into the hot oven. Bake for 20 to 25 minutes or until the top of the pancake starts to brown and the edges are crispy. Cut the pancake into 1 1/2-inch squares and arrange on a serving platter. Spoon the avocado on top and garnish with a few fresh rosemary leaves. 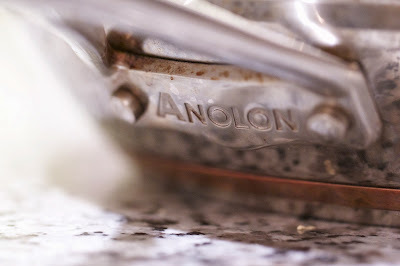 Disclosure: I received free product from Microplane and Anolon. All opinions are my own. This looks delicious, Matt! I've never been able to resist something cheesy and crispy. Thanks so much for helping raise diabetes awareness today. This looks really great! I love potato pancakes and I know I'd love this version. This sounds amazing! I've got to try it!! Looks yummy! I'm wondering...where are the results from the last giveaway? Love your blog by the way...everything is super yum :) THANKS! Tami, Collen M was the winner of the slow cooker. Thanks for the comment and I'm rooting for you on this one. You'd love the skillet! Thanks! My dad is a diabetic and he always gets in trouble with my mom for trying to sneak hashbrowns. :) It's his weakness...not the candy, but the starchy potatoes! I never thought about trying sweet potatoes! Thanks again! Great looking recipe Matt! Definitely will give this a try! One the family will enjoy! I don't currently cook for a diabetic but my grandfather was a diabetic and loved sweets but we did our best to find desserts that worked with sugar alternatives. I don't cook for a diabetic at all but I've been trying to serve healthier meals by having more veggies and smaller portions of meat. My brother is a Type II Diabetic, learning of it in his mid-thirties. When they are over I am mindful of the carbs is serve at dinner and the desserts in the evening. I often cook for my mother in law who is diabetic. I try to use lots of fresh veggies and fruit and use whole grains instead of more processed foods. My dad is diabetic and my husband and I often cook for him. We make sure to serve lots of leafy green vegetables with every meal. This pancake recipe looks amazing. I'm not diabetic (and I'm working on not becoming one) but I do think we all need to have healthy food like this on our tables. I don't cook for a diabetic but am trying to cook healthier meals. No, I don't cook for anyone that's diabetic, but I still try to cook as healthy as possible! Amazing recipes,yes. One of our family is diabetic so this will help lots. We have a young son, and try to cook well balanced meals. We do not cook for anyone diabetic however. I don't cook for anyone diabetic, but have family members who are diabetic. So I try to maintain a healthy lifestyle so I do not become diabetic too. Basically my entire family is diabetic (I am the exception), so whenever I am over at my parents we are cooking with lots of fresh veggies and lean proteins.